Ancient DNA from Cheddar Man, a Mesolithic skeleton discovered in 1903 at Gough's Cave in Cheddar Gorge, Somerset, has helped Museum scientists paint a portrait of one of the oldest modern humans in Britain. Cheddar Man lived around 10,000 years ago and is the oldest almost complete skeleton of our species, Homo sapiens, ever found in Britain. In the video above, three of the scientists who studied Cheddar Man discuss their work. This #NHM_Live was broadcast on Wednesday 18 April 2018. New research into ancient DNA extracted from the skeleton has helped scientists to build a portrait of Cheddar Man and his life in Mesolithic Britain. 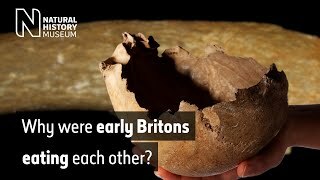 The biggest surprise, perhaps, is that some of the earliest modern human inhabitants of Britain may not have looked the way you might expect. Dr Tom Booth is a postdoctoral researcher working closely with the Museum's human remains collection to investigate human adaptation to changing environments. However, Cheddar Man has the genetic markers of skin pigmentation usually associated with sub-Saharan Africa. This discovery is consistent with a number of other Mesolithic human remains discovered throughout Europe. 'Cheddar Man subverts people's expectations of what kinds of genetic traits go together,' he adds. Cheddar Man was a Mesolithic hunter-gatherer (fully modern human) with dark skin and blue eyes. He was about 166 centimetres tall and died in his twenties. His skeleton was uncovered in 1903 during improvements to drainage for Gough's Cave, a popular tourist attraction. When he was first found, there were claims that Cheddar Man was the long-sought earliest Englishman, with exaggerated dates of 40,000-80,000 years. But subsequent radiocarbon dating from the 1970s onwards suggests he lived around 10,000 years ago. His skeleton shows a narrow pelvis shape. It's uncertain whether a hole in his forehead was from an infection or from damage at the time of excavation. Like all humans across Europe at the time, Cheddar Man was lactose intolerant and was unable to digest milk as an adult. At the time Cheddar Man was alive, Britain was attached to continental Europe and the landscape was becoming densely forested. In addition to seeds and nuts, his diet would have consisted of red deer, aurochs (large wild cattle) along with some freshwater fish. While Cheddar Man was not found with any recorded animal or cultural remains, other Mesolithic sites offer clues about his diet and the kind of cultural life he may have been part of. Star Carr was a Mesolithic settlement in North Yorkshire that predates Cheddar Man by around 1,000 years. There, archaeologists uncovered red deer skull-caps (which may have been worn as headdresses), semiprecious stones including amber, hematite and pyrite and an engraved shale pendant known as the oldest Mesolithic art in Britain. While impossible to say for certain, similar kinds of objects may have been familiar to Cheddar Man. Most of the Mesolithic human remains that date to this period were discovered in caves and there is a strong tradition of cave burial in the region. 'About a mile up the road from where Cheddar Man was found, there is another cave known as Aveline's Hole which is one of the biggest Mesolithic cemeteries in Britain. Archaeologists found the remains of about 50 individuals, all deposited over a short period of 100-200 years,' says Tom. Conservator Effie Verveniotou examining the oldest nearly complete modern human skeleton ever found in Britain before it went on display in the Museum's Human Evolution gallery. Cheddar Man's case is quite unusual because at a time when communal burials were common, he was found buried alone. 'He was recovered from sediment but it wasn't clear whether he had been buried or just covered in sediment over time by natural mineral deposits in the cave,' says Tom. According to several Victorian accounts, a large quantity of bones, teeth of extinct animals, flint knives and bone instruments were, unfortunately, wheelbarrowed out from the site and discarded. Some must have been from earlier occupations of the cave but it is possible some would have held additional clues about the life of Cheddar Man and other humans who once lived in the region. Coaxing data from ancient DNA can be painstaking work. Dr Selina Brace specialises in ancient DNA at the Museum and worked closely on Cheddar Man. As soon as an organism dies, DNA begins to break down. Temperature and humidity also make a big difference to the quality of data that it's possible to extract. The consistently cool conditions of Gough's Cave and layers of natural mineral deposits both helped preserve Cheddar Man's DNA. Excavations at Gough’s Cave in Cheddar Gorge. 'We used to use leg bones or teeth as the thick bones and enamel keep DNA quite intact, but in the last two years we've shifted to using the petrous, or inner ear bone, which is the densest bone in the human body,' she says. After extracting the DNA Selina and the team used next-generation shotgun sequencing, which involves defining millions of fragments of DNA distributed randomly across the genome, to create a library of Cheddar Man's DNA and map what they found against a modern human genome. 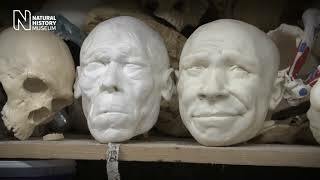 The model of Cheddar Man was made by Kennis & Kennis Reconstructions who specialise in palaeontological reconstructions. The artists took measurements of the skeleton, scanned the skull and 3D printed a base for their model. Are you related to Cheddar Man? Modern-day British people share approximately 10% of their genetic ancestry with the European population to which Cheddar Man belonged, but they aren't direct descendants. Current thinking is that the Mesolithic population that Cheddar Man belonged to was mostly replaced by the farmers that migrated into Britain later. Visit the Museum to see Cheddar Man in person in the Human Evolution gallery. Cheddar Man skeleton is on loan to the Museum from the Longleat Estate. The First Brit: Secrets of the 10,000 Year Old Man was broadcast on Channel 4 on 18 February 2018. Do you have questions about how the scientists arrived at their conclusions about Cheddar Man? Read this FAQ to find some answers. The scientific research behind this work is detailed in the preprint paper Population Replacement in Early Neolithic Britain. A television documentary will follow Museum scientists as they help deduce the astonishing facial appearance of Britain's oldest complete skeleton, Cheddar Man.